Notes: They are open to the public April through November. Some members of Nightwatch Paranormal went to Salem, MA on vacation, cause as a paranormal team, that is the sort of thing we do. We chose the Halloween weekend because we wanted to experience the whole area in all it's full bloom craziness. 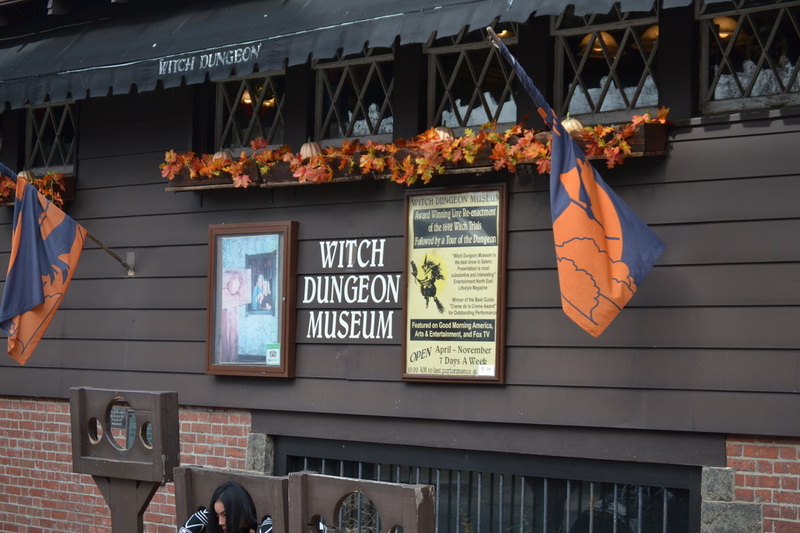 Doing the tourist thing, we wanted to hit all the Witch related museums that we could. We may have missed a few, but not likely. We expected to be entertained, informed, and intrigued - and we were. What we didn't expect, was to discuss any of these types of tourist locations on the website. As to the location itself, it starts with a short history of the events, then goes into a re-enactment. The 10 minute or so play is well done theater, taken from the transcripts of the trials. The performers were vary passionate in their portrayals. The Mannequin jury and judge seemed unmoved though. After that you go down into the basement Dungeon. Although the original has long since been destroyed, they have a beam from the original location. The Dungeon portion starts with a guide explaining what it was like, and then explaining the scenes you will be encountering. After that is it semi-self guided as you work your way out. The group we were with was sort of large, which made the area a bit crowded to start. It seemed a bit oppressive due to the darkness and the crowding, which is how it must have felt with 150 or so accused witches hanging out. We let the mass of people work their way out and we hung back for pictures. Here is where things started to go a bit wonky. First off, due to the crowding, people kept banging and hitting my camera bag. Even when the crowd thinned out a bit. When it was still happening when it was us and another random couple, it finally became apparent it may not be the fellow tourists. To be fair, I was preoccupied with trying to get my camera to take pictures. I use this camera in pitch black on investigations. For some reason it would not take a picture. It also would not let me turn on the flash. At all. When we were leaving the other couple we didn't know was overheard complaining about the same two things, their camera would not flash or take a picture. I was going to ask them about it when one of our members came up and explained they saw what looked like an Orb.... with their own eyes. At the time it was only us and the other couple. No one was using flash photography ( cause we were not able) We also felt and saw movement in the darkness out of the corner of our eyes. At this point we were alone in the area, and thought it may have been us being over active. It was not until later in the day at lunch that we talked about it and compared stories. Thinking back the oppressive feeling when it was crowded did not diminish with the lessening of the crowd. We did not go back as there was much to see and do, but we will be reaching out to the staff to see if they ever experience anything. The Location is not anything especially significant in the scope of the witch trials. It may be the emotions of the re-enactment. It may be something attached to the beam from the original dungeon. It may be the residual fears and location among so much witchery. It may be all that combined, or none of that at all. We definitely had a paranormal experience there. We posted all the pictures we were able to take on the link up top of the page. The camera bag tugging did keep up all the day, but part of it may be attributed to the growing crowd of revelers thought the town. Returning home and researching the location for this story for the Nightwatch Paranormal web page and Facebook I came across a few things. Note, I try not to do any research prior to heading out to a location so I do not prejudice myself. Also, it is a tourist location, who would haunt that? Well, I have come across accounts of dark shapes in the basement. There is also reported a monk like man glimpsed in the basement area. People have heard a male humming when no men have been in the building. Visitors report the cobweb feel on arms and back. People have felt cold breaths on the back of their necks. The man may be related to the site, as this may have been the location of an old church. We are looking forward to unearthing more information on this location in the weeks and months ahead. Updates will be added to the story on the website.